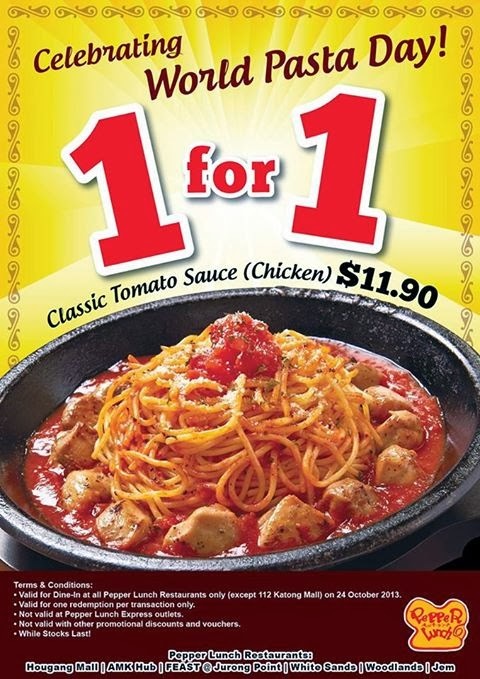 Singapore Freebies: Pepper Lunch: Buy 1 Free 1 Promotion for Classic Tomato Sauce (Chicken)!! Pepper Lunch: Buy 1 Free 1 Promotion for Classic Tomato Sauce (Chicken)!! Pepper Lunch is all set to bring the piping hot goodness of fresh meat and vegetables to all who appreciate fine quality steak at great value. Using a specially designed and patented hotplate and electromagnetic cooker, Pepper Lunch give our guests total control over their meal by serving the meal in its most natural raw state and encouraging them to make their own decisions. Whether it is Beef Pepper Rice with Garlic Soy Sauce, medium rare Tenderloin Steak or beautifully browned Hamburger Steak, you can now sizzle it your way, only at Pepper Lunch.